My next slice of geology is one of my most prized possessions. 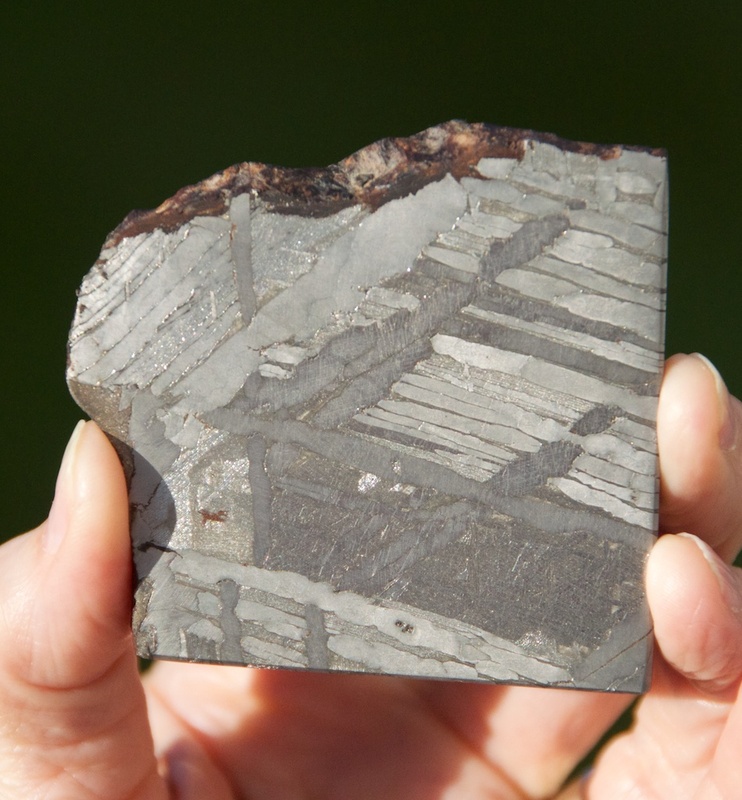 It is a thin section of an iron meteorite, cut so that it displays a feature called Widmanstätten lines. 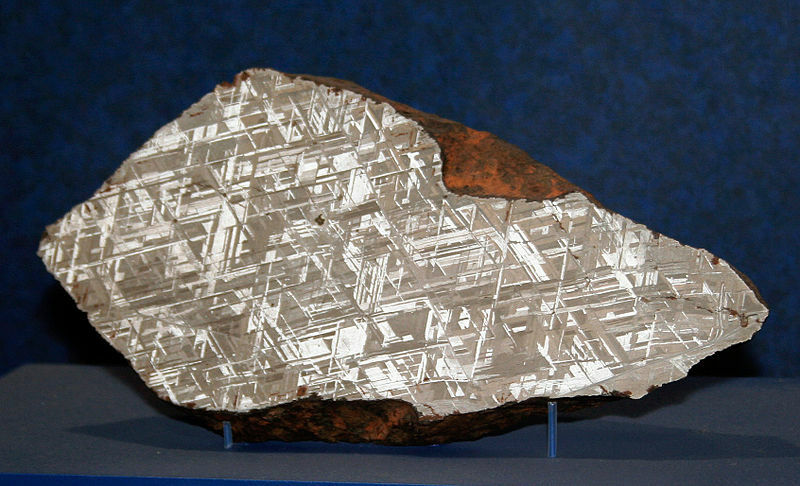 Looking like a street plan of some futuristic city, this is a crystalline pattern unique to nickel-iron meteorites. These big crystals are not usually found in metal, and cannot form on Earth. Why? Because they are the result of intense heat, followed by a period of extremely slow cooling; and I do mean extremely slow. This lump of iron, which may once have been part of an asteroid, has been cooling at a rate of about 1°C per million years. The presence of Widmanstätten lines therefore proves that the stone in your hand is of extra-terrestrial origin, and was probably formed millions of years before the Earth itself. How mind-boggling is that? The crystalline formation was first discovered in Naples in 1804 by an English geologist named William Thompson; four years later, an Austrian Count called Alois von Beckh Widmanstätten also noticed the effect, while flame-heating iron meteorites. Because Thompson’s discovery was not widely known, the pattern was named after the Count. If you are interested in the constituents of the meteorite, it contains the alloys kamacite (which has a low nickel content) and taenite (rich in nickel), along with a compound called plessite. The percentage of nickel determines the breadth of the lines. In order to display the pattern, meteorite collectors slice the rock, and then treat it with a solution of ferric chloride or nitric acid before washing and polishing it. Mine is just a small piece compared to the many magnificent specimens that exist, but I still get it out every now and again and try to imagine how old it is. Incredible. I’ve collected fossils and meteorite fragments my entire life and never seen or even heard of the Alvord meteorite; it’s beautiful and troubling at the same time. Thanks so much for this! Goodness! I must admit I hadn’t heard of it either, but I haven’t got that much knowledge about significant meteorites. It is certainly beautiful. I imagine it would weigh a ton! Nice to hear you collect them, too! 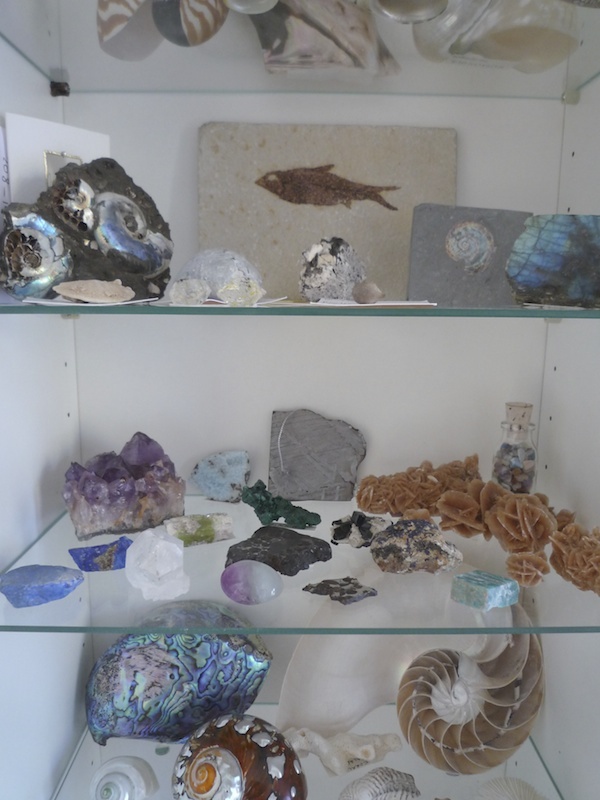 Fascinating – I love your cabinet of curiosities. Thank you! Such a source of pleasure. I’ve collected rocks for as long as I can remember. Wonderful, Jo! (I trotted right over to Wikimedia and added the Alvord Meteorite to my wallpaper collection. Digital collections are about all I can handle anymore.) Contemplating the age of that bit of rock might be an excellent meditation, as long as you keep it abstract. 🙂 I recently learned that gold is not from Earth, it’s made in the interior of massive stars. It’s released when the star goes supernova. But I’d still rather have a slice of meteorite than a nugget of gold! A good meditation – I think you’re right, Pat! It certainly puts things into perspective. That is true about gold, I think I heard that on one of Brian Cox’s programmes, but I’d forgotten it. Oooo, I haven’t got a nugget of gold (yet). I remember dragging my parents into mid-Wales in search of gold when I was a youngster. Dearie me. Never found any! Yes – I think the meteorite is sliced at an angle to enhance the effect. Yes! Quite fragile, too. I have a couple of other meteorites, one of which is prone to crumble a little around the edges. That is indeed mind-boggling. I’ve never seen anything quite like it before, it’s beautiful, and all the more fascinating when you know how it formed. Your collection cabinet looks intriguing. Thank you, Lorna, and yes – I sometimes like to try and imagine where this little meteorite has been! We were at a show over the summer and the Edinburgh Observatory had a small stand, with a display of different meteorites. I really enjoyed looking at them, and I took my own in the next day to show them. Which reminds me, I must pay a visit to the Observatory! How interesting, I don’t think I’ve ever seen a display of meteorites. You mean the Royal Observatory on Blackford Hill? It’s well worth a visit, I think you’d love it.